Load Capacity of 75 lbs. 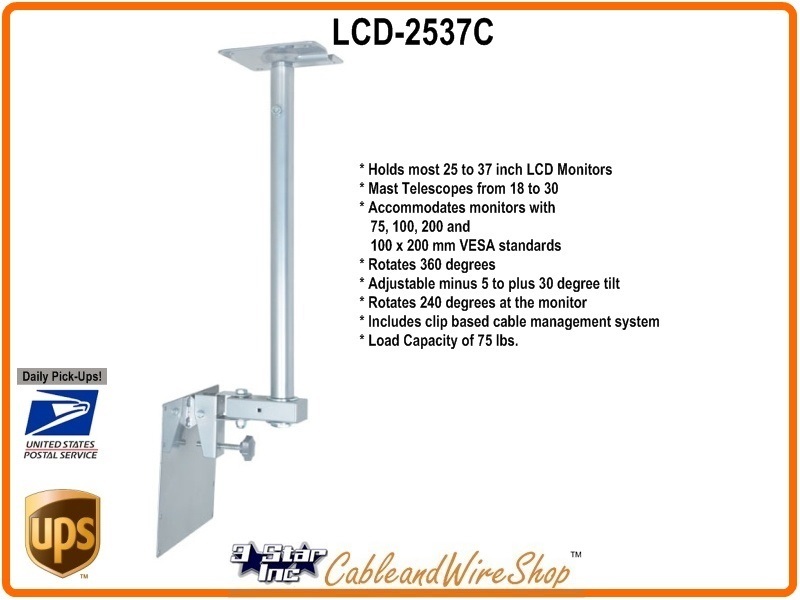 Ceiling Mount capable of holding most 25 to 37 inch LCD Monitors with 75, 100, 200 and 100 x 200 mm VESA Standards. The Mast Telescopes 18 to 30 inches from the Ceiling in 360 degree Rotation and a Tilt Angle of minus 5 to plus 20 degrees with additional rotation at Monitor of 240 degrees. This Mount has a Load capacity of 75 lbs. and comes in a Black or Silver powder coat finish. This mount is designed to attach to a load-bearing member or other suitable support surface and primarily composed of Tubular steel, arc welded, and with Nylon filled Nuts.